Find the perfect hotel for your stay in Fair Area MilanoCity - from discount and affordable hotels for the budget traveler to luxury four star and five star Fair Area MilanoCity accomodations. You can also search for hotels in that cater to your specific needs, such as extended stay hotels, hotels for business traveler / event planning, suite / boutique hotels and much more. Welcome to the Holiday Inn Milan - Garibaldi Station, Located in the heart of the city s and fashion and shopping area. All the city s main attractions are within easy reach of the Hotel using public transport: the Cathedral, The Scala Theatre, the Sforzesco Castle, the Basilica of S.Ambrogio or, for a nice stroll, Corso Montenapoleone, Corso Buenos Aires and maybe a visit to Leonardo s Last Supper, the Arcimboldi Theatre and the Brera Art Gallery. Hotel is within easy reach of the new Rho/Pero Exhibition Centre (10 km) and very close to the Milan Exhibition Centre (15 min.). Holiday Inn Milan - Garibaldi Station, . a recently-built complex, has 129 comfortable bedrooms, all perfectly soundproofed, furnished tastefully in modern style and Internet connection. The hotel has three meeting rooms especially equipped for business meetings, encounters and training courses; with fast WI-FI Internet connection. Butterfly restaurant in 'fusion' style offers care for detail and a relaxing and pleasant ambience. A Cocktail Fashion bar with daily happy hour and theme cocktails, not to be missed. Free Mini Gym at disposal daily and indoor parking-garage. Limousine service on req. Holiday Inn Milan - Garibaldi Station, for business or leisure, your home from home in the centre of Milan. Hotel Valganna is situated in the Bovisa district, an area where Milan Polytechnic University has its campus with the prestigious Architecture and Design faculties, Prometric Center, near the FAIR Milano City (4 minutes), the New Area FAIR RHO/PERO (9 km) and the new museum Triennale.People need to spend time in Milan, Italy's business capital, for many different reasons, including work, university, tourism and recreation. 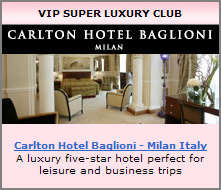 Milan presents a huge and varied range of hotels; at Hotel Valganna we think we can offer something different. We're certainly not unique, but various different characteristics combine to give you the comfort of your own home. Opened in 2002, the Enterprise Hotel is the first ever design hotel in Milan. Situated in one of the most lively sections of the city, the hotel's location is definitely strategic: Enterprise Hotel is a short walk away from Fieramilanocity, on the way to the Pero-Rho New Trade Fair Centre, and a few minutes from the city centre; it is close to Castello Sforzesco, Arco della Pace and La Triennale museum, and at a very short distance from San Siro stadium. Most of the trendiest, most fashionable clubs and hangouts are also nearby. Enterprise Hotel is the boutique hotel that best represents Milan’s creative and innovative spirit, with its ideal combination of inventive design and traditional efficiency. The Meliá Milano is located right in a strategic zone of Milan, at a walking distance from MilanoFieraCity, just 8 minutes from the new 'Rho' Exhibition Center and 10 minutes from the city centre. Strategically located 45 km from Malpensa Airport and 25 km from Linate Airport, with bus stops and a tube station right outside the hotel entrance. Its proximity to the Trade Fair Centre, its excellent communication with the City Centre and the airport and the 13 meeting rooms with capacity for up to 500 people makes the Meliá Milano a great place for business meetings. There is also a full breakfast buffet, an elegant à la carte restaurant, a fully equipped Business Centre and a luxury spa inside the hotel. You can enjoy relaxed moments in our spectacular Bar del Prado, tasting the latest innovative 'Happy Hour' drink, or spend time in the exclusive Vitola Bar.